Rare 1920s French racing voiturettes all sold above estimate at Historics Classic Car Auction. An exquisite collection of painstakingly restored French Amilcars and Senechals was sold in its entirety at Historics 30th November sale held at Mercedes Benz World, Weybridge. Each one had undergone disassembly, many years of searching for parts, then reassembly with meticulous, almost obsessional attention to detail by the late Trevor Pask, who died suddenly in 2011, and the cars were offered for sale by his bereaved family. The 1924 Senechal TS2 was acquired by Mr Pask in 1975 and as a tribute to his fine work sold for £22,500, £7,500 above its highest estimate. 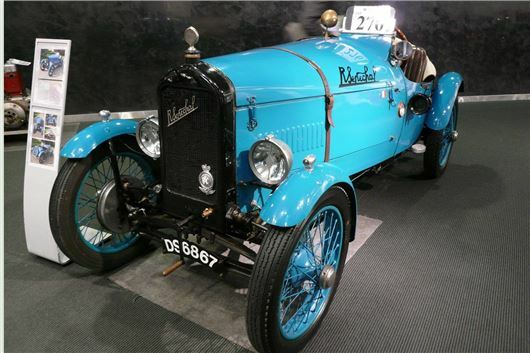 Another Senechal, this a 1924 Grand Sport, also acquired in 1975, sold for £21,500. The 1925 Amilcar CS sold for £19,000, but the star of the collection, a 1927 Amilcar CGSS Special Roadster, originally purchased by Mr Pask in 1973 as a basket case, and, after a long search for parts, finally rebuilt in 1984. fetched a resounding £46,000 - £11,000 over its top estimate. The undoubted star of the auction was a stunning supercharged 1930 Alfa Romeo 1750 6C Gran Sport, estimated at £280,000 to £320,000 that apparently saw a top bid of £310,000. A lovely 1941 BMW 327/28 Cabriolet sold for £110,000. A recreation of the 1989 Michael Keaton ‘Batmobile’ sold for £65,000, helped on its way by the presence of a recreation of Batman himself. The 1911 Vulcan 15.9hp two-seater, unearthed from a house hallway where it had been kept as an ornament for 28 years made £41,000, comfortably over-estimate. According to one of the dealers, “there’s money in Brass.” Basically, pre-WW1 cars are becoming increasingly collectable by investors. The extraordinary 1935 Mercedes-Benz 290 ‘Lang’ Pullman limousine ran out of bids at a disappointing £57,000. Disappointing because to restore that much car to that standard would cost upwards of £200,000. The Mini Alfasud special didn’t make it at all, bidding to only £1,900. A characteristic of the sale was the number of Porsche 911s turned into 1973 RS lookalikes, an even greater number of Mercedes-Benz SLs, and one less than eight Jaguar E-Types (one was withdrawn). I’ve listed them additionally in date-order to help anyone looking for such a car work out what to pay. With the Porsches, originality is where the money is, so a 130PS 911T made to look like a 1973RS will never be worth more than a third of the value of a good, genuine early 190PS 911S. Apparently Mercedes-Benz R107 SLs from 1984 and before are the ones that rust, but 1985s onwards were electro-galvanized. And as for E-Types there’s nothing like pedigree, which is why a 1962 ‘flat floor’ 3.8 coupe once run by ‘Lofty’ England, but far from perfect, sold for £68,000, while a beautifully restored 1964 S1 didn’t sell. That SIII 4.2 coupe, by the way, isn’t a typo. It was one of four development cars for the 5.3 V12 SIII and the only one with RHD, which makes it unique, but not especially desirable. All hammer prices plus 10% commission, plus VAT = +12%.